We bring you a mod that enables you to spawn mobs in Minecraft. 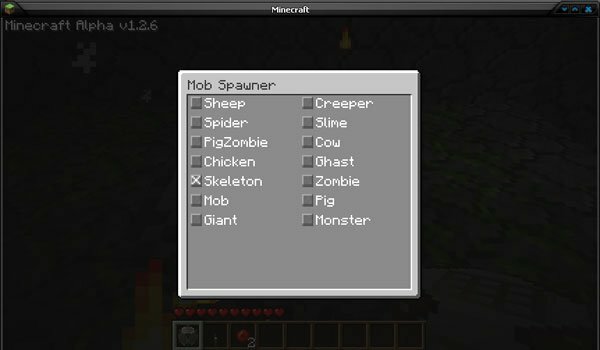 This Spawner GUI 1.6.2 and 1.5.2, provides a graphical interface where you can choose what kind of mob you want to spawn. When spawning take into account where these monsters live. Ie to launch slimes you should make it in highs between 0 and 16 blocs form the bedrok, but for the animals you should launch them in a place plenty of grass. How to install Spawner GUI Mod for Minecraft 1.5.2? Copy and paste the folder “1.6.2″ with another name, for example: “1.6.2ML”. Open “1.6.2ML” and rename .jar & .json files to “1.6.2ML”. Open “1.6.2ML” with notepad, and rename the “id” of “1.6.2″ to “1.6.2ML”. Open file “1.6.2ML.jar” and paste the contents of the downloaded mod. Open .minecraft / bin / minecraft.jar folder. Invasion of mobs in Minecraft!